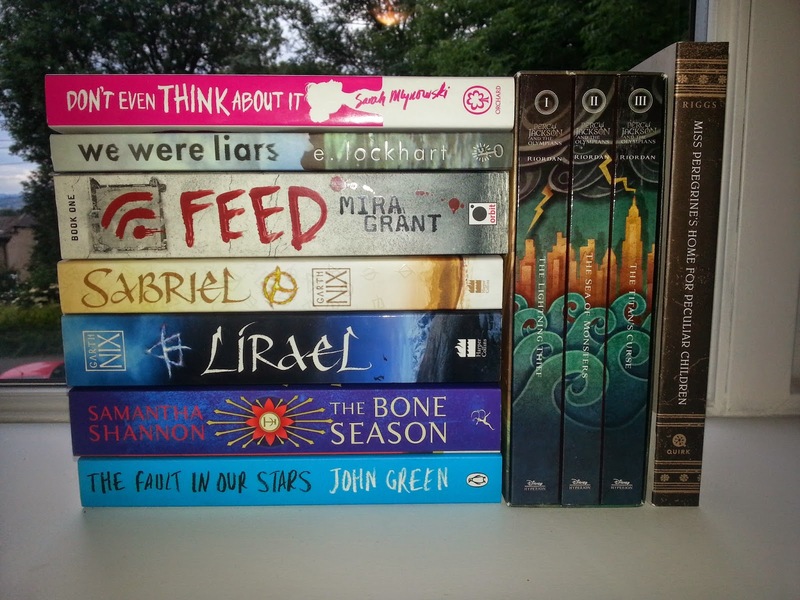 These are all of the lovely books that i'll be adding to my shelves this week, i'm super excited about some of these! Especially the Percy Jackson series, Feed & Don't Even Think About It. I haven't joined this feature and I should because I view everyone else's posts on it. Sabriel is the one that caught my eye. I haven't read this, but awhile back I remember an online book friend totally raving about how good this book and Garth Nix in general was. Nice haul. I admit I haven't read any Rick Riordan yet. But I will soon because I 've heard nothing but great things about his books. Great haul! Pretty covers all!!! Great books. I've read Sabriel, Lirael, Don't Even Think About It, and We Were Liars. The Bone Season is still waiting on my Kindle. I hope you enjoy all your new books and you don't find too many that you have to have when you are looking at other people's stacking the shelves posts. Come see what I got this week at Ms. Martin Teaches Media and Inside of a Dog. Happy reading! I saw Sabriel & Lirael on Epic Read's #TeaTime live show last week and it sounds like a really interesting series so i can't wait to read it! :) I'm really looking forward to reading Don't Even Think About It and We Were Liars, i'm planning on reading these two as part of the #RYBSAT read along this week! Oh i love these kinds of post but my TBR does get noticeably longer from looking at these posts! Haha. So many of these books are fantastic. The Percy Jackson series is great and don't even get me started on The Fault in Our Stars. SO MANY TEARS!! Garth Nix is a great writer too, but hella dark sometimes. I'm a new follower via bloglovin and GFC. I definitely clicked on the link to your blog because of the title. It's awesome. Iv'e just read The Lightning Thief and i'm about to start Sea Of Monsters, The Lightning Thief was SO good, got a feeling i'm really going to love this series! I need to read The Fault In Our Stars before Wednesday because i'm going to see the film, but i'm dreading the tears!! Heard some really good things about Garth Nix's books so i'm super excited to start them! I am curious to read Feed but not a priority enough to buy it yet. Hope you like it. Garth Nix's books are always a great choice! Happy Reading!